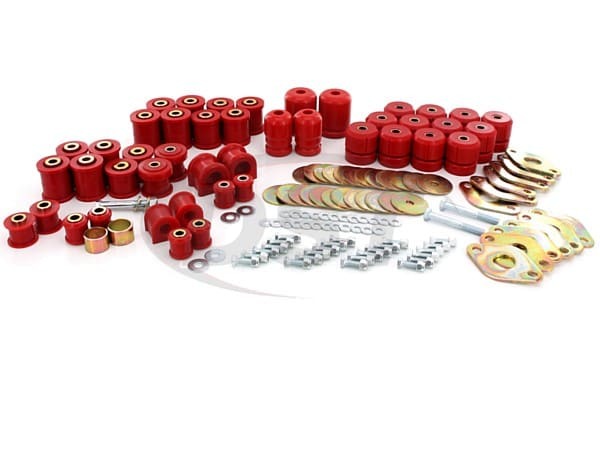 This Complete Bushing Replacement Kit for the 4 Door '07-'17 Jeep Wrangler JK will replace the factory installed rubber bushings with durable, long lasting polyurethane suspension bushings. Rubber bushings will degrade with wear and exposure to the elements, while polyurethane bushings will last the life of your Jeep JK and do a better job holding your suspension in place. Weak Link in your Jeep JK? The original (OE) rubber suspension bushings on your Wrangler JK provide a soft ride but they will eventually wear down. 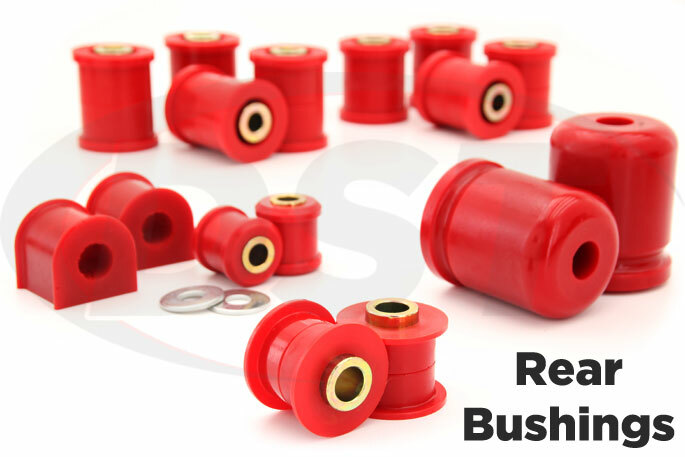 These soft bushings will absorb much of the noise and vibration transferred from the road but they won't last long compared to the lifespan of a '07-'17 Jeep Wrangler JK. When these bushings do wear down you will experience steering wander, wheel wobble, increased body roll, or uneven tire wear. Rubber bushing replacements will restore ride quality but they will likely only last about as long as those originals. 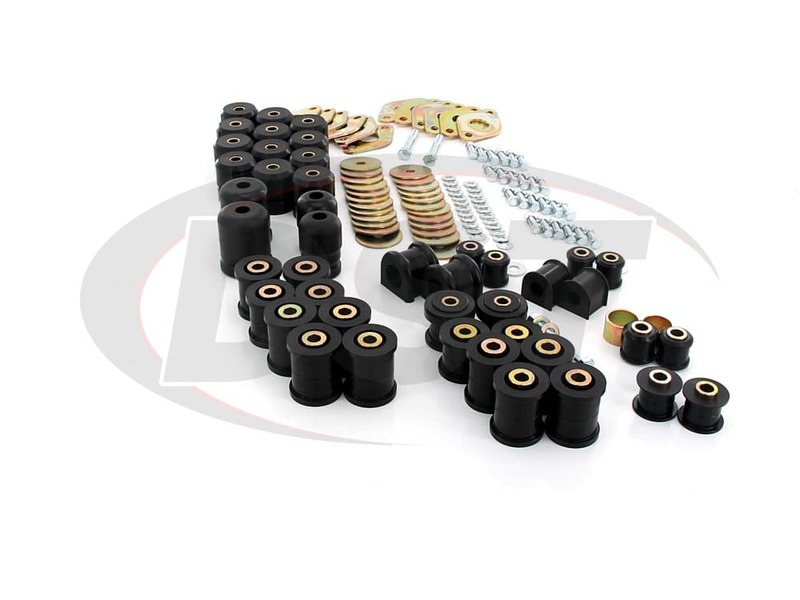 Even new rubber bushings will deflect when your suspension travels meaning alignment can shift allowing your Jeep to pull to one side, causing your tires to wobble, or decrease traction during a turn. 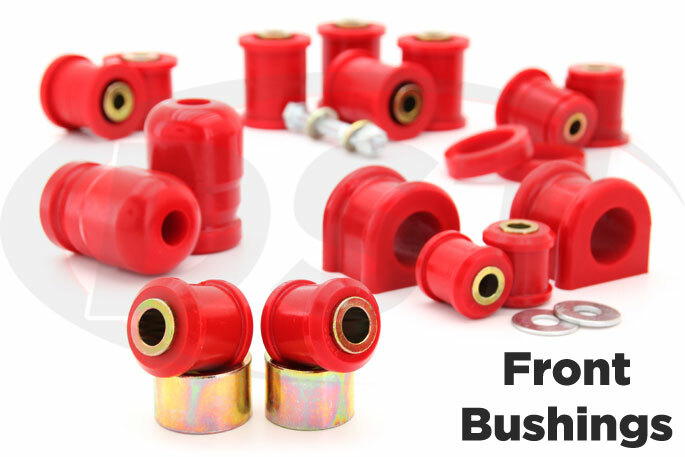 While rubber bushings do provide the softest ride possible, they just don't last and when they wear out your Jeep will need frequent visits to the shop for a realignment that might not last the drive home. 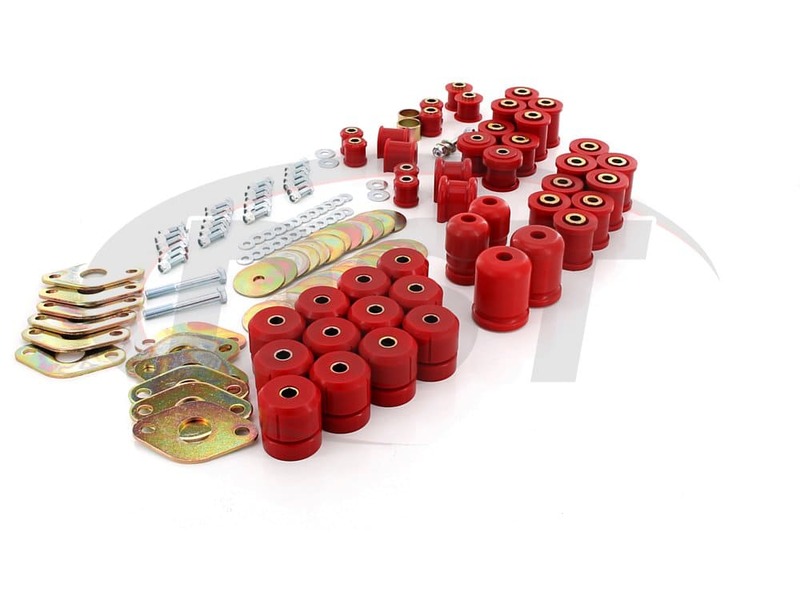 This kit includes the front control arm bushings which attach the axle to the chassis. 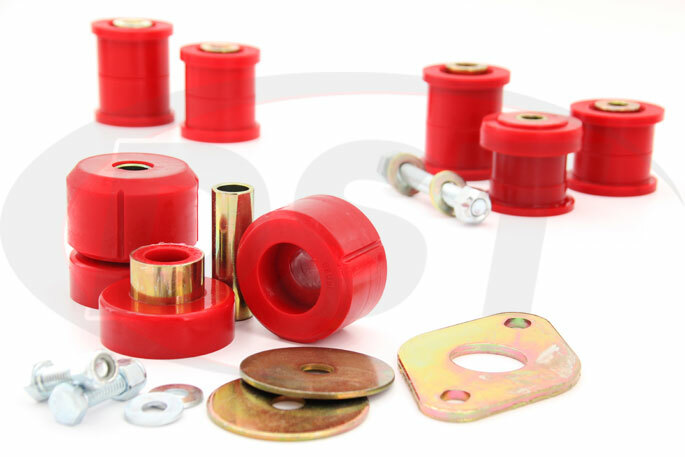 Since these poly bushings are much tougher than the original rubber they will reduce steering wander and shaking in the steering wheel that worn control arm bushings can cause. 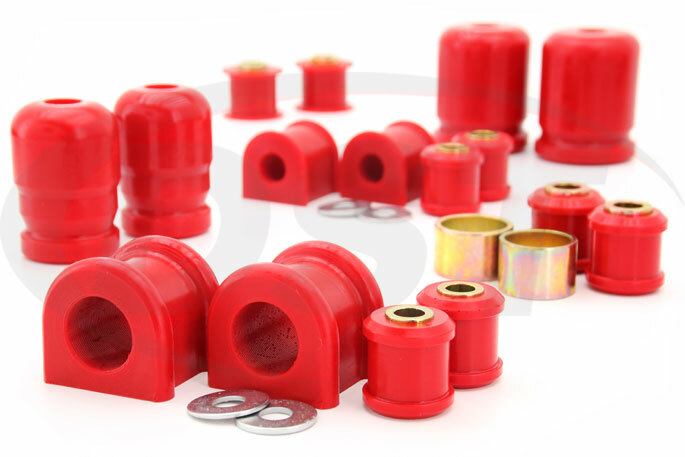 Stiffer polyurethane rear control arm bushings will also help maintain alignment and reduce uneven tire wear. These polyurethane body mounts will fit the 4 Door JK, keeping your ride height consistent and your doors and hood from sticking. The rubber body mounts wear down and will eventually be crushed, which can change the shape of your cab and cause it to lean. The track bar is important for tight steering and wheel alignment at speed, and while the track bar itself is very sturdy, the rubber bushings that hold it in place will wear down. 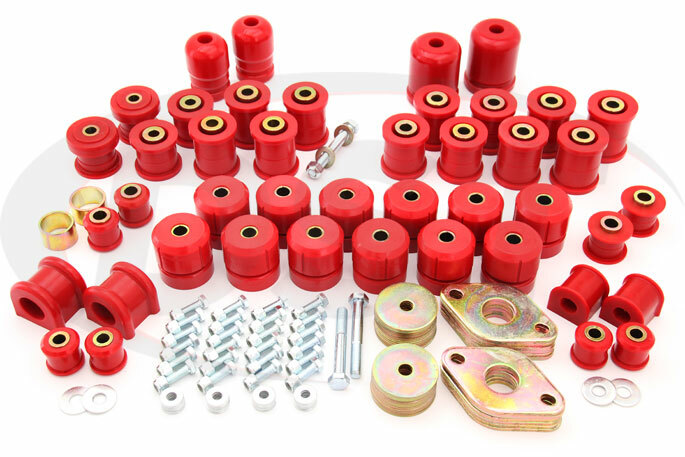 The front track bar bushings and rear track bar bushings in this kit will maintain the lateral alignment between the axle and the frame, reducing the chance of wheel wobble and improving steering. The sway bars for your Wrangler JK will be more securely connected to the frame by the front and rear sway bar bushings included in this kit. 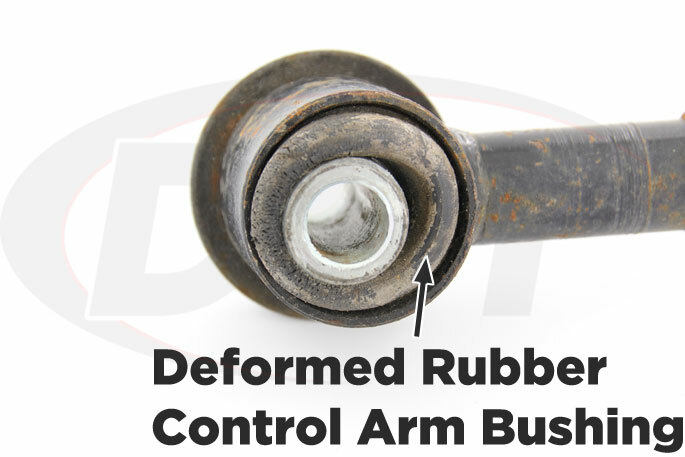 This stronger connection will make your stock sway bar reduce body roll like a larger diameter bar and increase traction during a turn. Front and rear bump stops will cushion the falls of aggressive off-roading or unexpected drops. 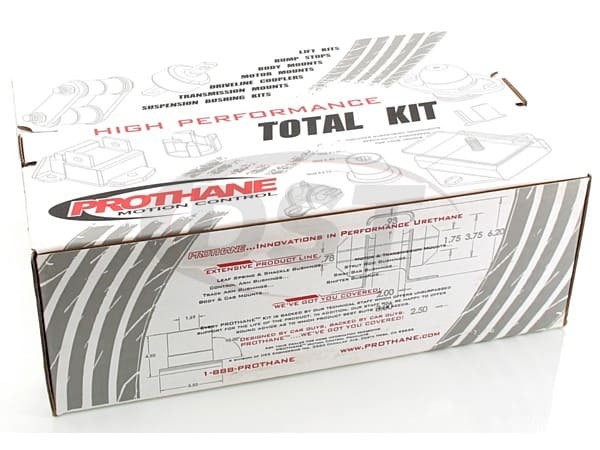 If you are looking to upgrade the suspension of your '07-'17 Jeep JK then Prothane's Polyurethane Bushing Replacement Kit is a great way to replace rubber bushings that will deflect and allow alignment shift with bushings that will hold alignment much longer. Polyurethane is a much more durable substance than rubber and still allows some give, meaning a better balance between durable suspension and a comfortable ride. Rubber is susceptible to excessive wear, heat, and motor chemicals but polyurethane is much more resistant to wear and immune to the elements. Whether you're looking to take your JK down Old Ore Road or just doing a little local mudding around Erath county on the weekends, polyurethane suspension bushings will last longer and maintain your Jeep's alignment better than OE replacements. 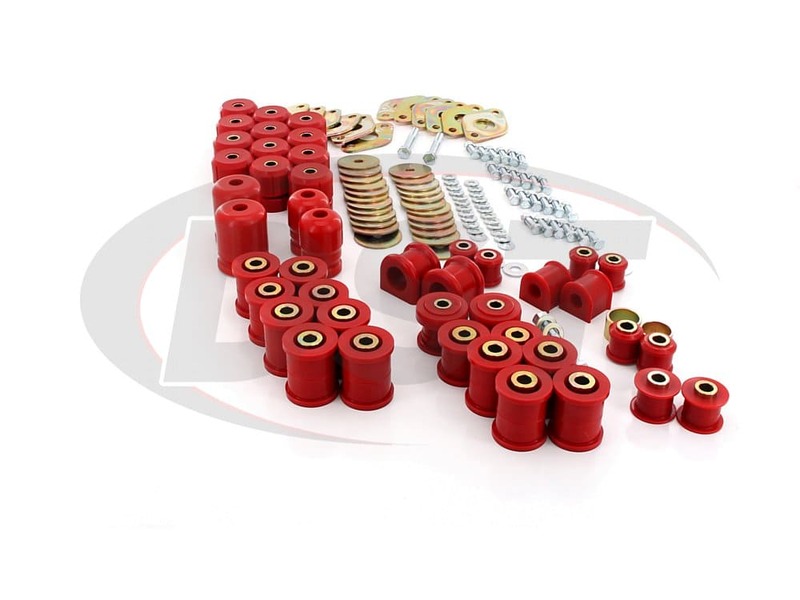 Replacing or upgrading the suspension bushings of your Jeep JK is a big part of the upgrade or restoration process and this complete bushing replacement kit will exchange the old, degraded, flexy rubber with durable polyurethane bushings. 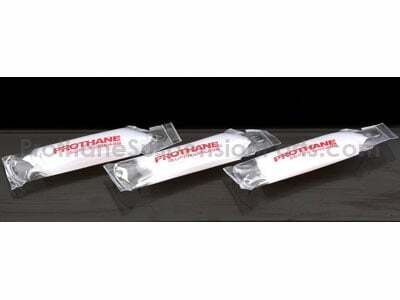 Prothane backs these bushings with a lifetime warranty which Suspension.com will take care of for you in-house. 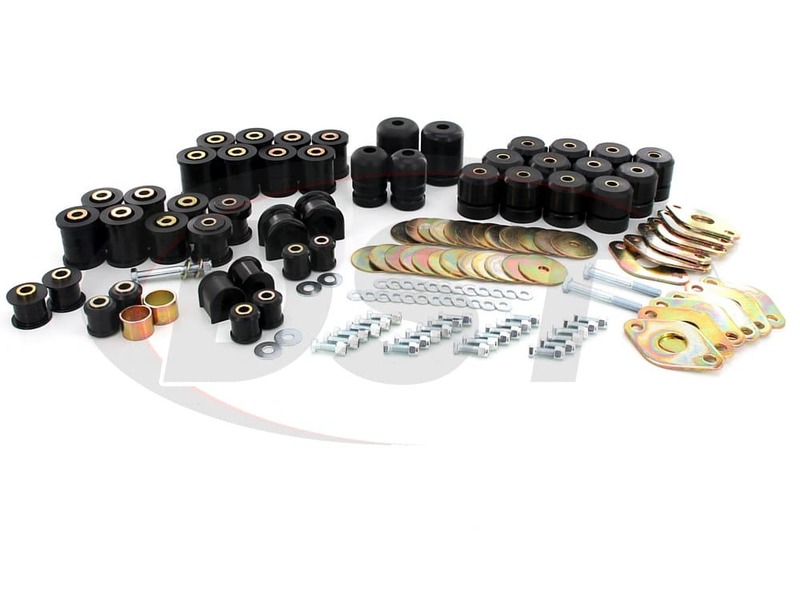 When you exchange rubber for poly you basically trade some comfort for a lot of durability and performance, so upgrade your Wrangler JK's suspension bushings with this complete bushing replacement kit. starstarstarstarstar" Good looking and solid build quality "